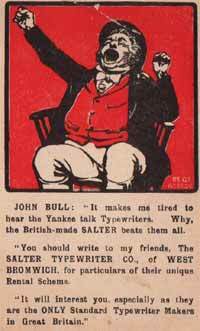 The Salter typewriter was not a mass produced machine. It was constantly changed and upgraded. When two machines of the same model are compared, there are often many differences in parts. When a major change was made, the model number was adapted, or the word improved was added to it, as in this case. Compared to the early Salter 5, there are major changes in the improved version. The carriage system is radically different and the ribbon spools were moved from under the type basket to above the platen. 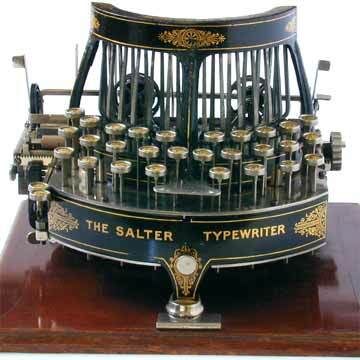 George Salter is said to have taken over the production of this downstrike typewriter from James Sam. Foly in London and John Henry Birch of West Bromwich, which may explain for the model number 5 on the first machine, although earlier production machines are not known. The Salter 5 was the only in the line that had a round keyboard. All later models had straight 3-row keyboards. The later models will be dealt with separately. Also see the book â€œTypewriterâ€� page 128.